And welcome to First Book of the Year hosted by Sheila at Bookjourney. I’m beginning the year with a book about one of my favorite topics – birds. That’s Charlie in the photo with me. She is my reading and blogging buddy, and very curious about this book with the gorgeous cover. Regular visitors know I adopted Charlie from a bird rescue shelter. I’m also a volunteer at the shelter and a volunteer wild bird monitor for the forest preserve. If only I could get paid to do work I enjoyed! Pandemonium, the home and bird sanctuary that Raffin shares with some of the world’s most remarkable birds, is a conservation organization dedicated to saving and breeding birds at the edge of extinction, with the goal of eventually releasing them into the wild. 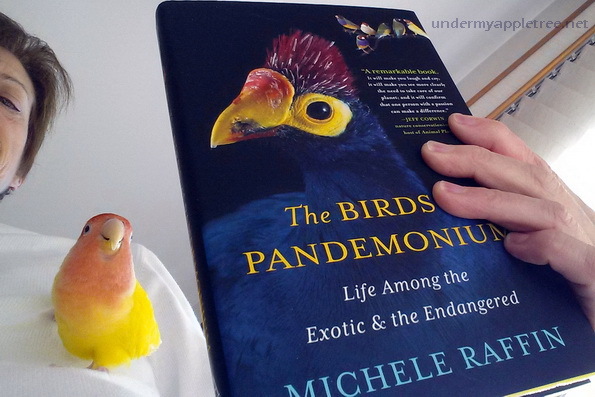 In The Birds of Pandemonium, she lets us into her world–and theirs. Birds fall in love, mourn, rejoice, and sacrifice; they have a sense of humor, invent, plot, and cope. They can teach us volumes about the interrelationships of humans and animals. I love the picture! Charlie is adorable! Happy Reading and Happy New Year! Sounds like the ideal read for you! Love the cover, and the picture. Happy New Year! That sounds like a great choice! What a beautiful bird Charlie is! I love her coloring. This sounds like the perfect book for you. I live near a bird sanctuary – an island a half hour ride by boat. It is wonderful visiting there. Pretty neat photo. ENJOY the book. Beautiful picture and beautiful bird! It’s so interesting to hear about readers’ other hobbies and interests every now and then! Happy New Year! Charlie is a smile. That is an interesting read. I think people often forget animals can have feelings and human like interactions with others in their species. Hau’oli Makahiki Hou to you. It sounds like the perfect book for you, Leslie. And I love the cover! After admiring your amazing bird photos for several years now on Saturday Snapshot, your book choice brought a big smile to my face! Your perfect book for the new year, and a great pic! Leslie, I hope your new year is wonderful. Lovely to see you and Charlie, he sure is beautiful. Looks like perfect reading for you. That’s the perfect book for you! Happy New Year! Wonderful photo. Your books looks like a great one to start the year with. I hope you love it. Happy New Year! Charlie is a handsome guy. I am sure he is a great reading companion. Happy New Year. Love your book picture!! Happy New Year and enjoy reading your 1st book of 2015!! Adorable pic Leslie — enjoy the book.